Gov. Kate Brown signs historic legislation. Photo courtesy of Portland General Electric. PORTLAND, Ore. – James John Elementary School, with its recently installed rooftop solar panels, was the setting today as Gov. 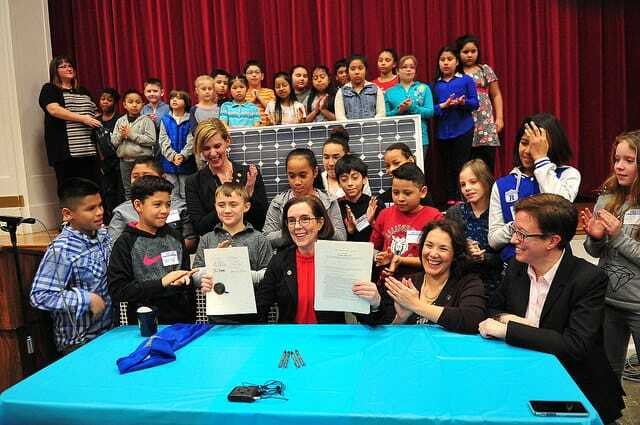 Kate Brown ceremonially signed historic legislation to double the state’s renewable energy standard, move Oregon electric bill payers off coal-fired power, and expand vehicle electrification. The Clean Electricity and Coal Transition Act was developed by a unique alliance including the NW Energy Coalition and many of its members and allies: the Citizens’ Utility Board of Oregon, Climate Solutions, Oregon Environmental Council, Oregon League of Conservation Voters, Natural Resources Defense Council, Pacific Power, Portland General Electric, Renewable Northwest and Sierra Club. Doubles the renewable portfolio standard for the state’s two largest investor-owned utilities, Portland General Electric and Pacific Power, to 50% by 2040. Allows the two utilities’ Oregon customers to stop paying for coal-fired electricity by 2035 at the latest. Commits utilities to maximizing energy efficiency achievements. Encourages development of transportation electrification where utility involvement makes sense. “This groundbreaking law resulted from a collaboration of utility, consumer, and environmental interests that worked together to ensure cleaner air and reliable, affordable electricity for Oregonians,” said Natural Resources Defense Council western energy director Noah Long. According to a study by Oregon Global Warming Commission chair Angus Duncan, the Clean Electricity and Coal Transition Plan will cut Oregon’s electric sector carbon emissions in half by 2030. Analyses by Pacific Power and Renewable Northwest find that achieving these dramatic reductions will raise rates by no more than 1% and could even reduce them by more than 2%. Go here to see statements from other partners in this historic endeavor. The NW Energy Coalition is a 34-year-old alliance of more than 100 environmental, labor, civic, faith and human service organizations, progressive utilities and businesses in Idaho, Montana, Oregon Washington and British Columbia.